Western Ag Enterprises, Inc, has several materials available for the secondary containment of fuels and fertilizers. For long-term containment, or containment situations that require high puncture resistance, durability and extreme UV resistance, XR-5® may be the liner of choice. XR-5® material offers maximum performance such as a highly resistant, non-degradable membrane surface with extreme puncture and tear resistance, dimensional stability under high loads and extreme temperature fluctuations. XR-5® is also easily heat weldable, as the coating compounds bond molecularly when heat welded. XR-5® is not a scrim supported flexible liner, but it is an extremely tough woven composite fabric of Dupont Dacron® polyester fibers that has been molecularly coated with sophisticated compounds that are minimally degradable in adverse weather conditions and environments. With this combination, the liner and coating offer a unique balance of performance features. XR-5 one side coated per pass assures the bonding process and a very high quality finished material. The exclusive coating compound contains Dupont Elvaloy®, which is essentially noncrystalline and therefore not susceptible to environmental stress cracking. XR-5's flexibility makes it possible to easily fit the liner around irregularly shaped applications. 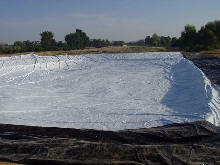 XR-5®also is proven to prevent seepage of caustic chemicals. XR-5's resistance to chemicals is evident since the geomembrane has a long history with hydrocarbon containment and has been lab tested for over ten years in constant contact with crude oil. Additionally, field seams and CQA are minimal since the flexible XR-5 ®can be factory manufactured into panels approximately 15,000 square feet each. Nobody wants to trust his lined application to untried liners or liners with known problems. With a 20-year-plus track record in tough applications throughout the world, XR-5® geomembrane is the first choice when max tensile strength, high UV resistance and minimal thermal expansion and contraction are required.